Those of you who sublimate are most likely familiar with the Sawgrass PowerDriver print and color management solution. Sawgrass has now announced that a new version of the software, Version 4, is now available. The new software is now available for both the Ricoh SG 3110DN and Ricoh SG 7100DN inkjet printers. Version 4 of the software was developed after input from resellers and end users. The new version is designed to improve the end user experience and offers a higher level of performance. The goal was to provide a product that supplied desired options and functions while still being easy to use. This new version of the software also contains a Resources Tab, which provides link to helpful portions of the Sawagrass Ink website. Through this tab you can access Technical Support, Sawgrass Education, and the Sawgrass website itself. EnMart is proud to announce we will have a new larger size desktop sublimation printer available within the next week. This printer replaces the Ricoh GX e7700N which formerly was the large desktop printer option. The new Ricoh printer is the Ricoh SG 7100DN. First introduced to the European market in early 2013, this printer has been tested and proven to be a trouble free sublimation solution with a robust printing capacity. This is the sublimation printing solution of choice for rapidly expanding shops that want a sublimation solution that is both reliable and fast. 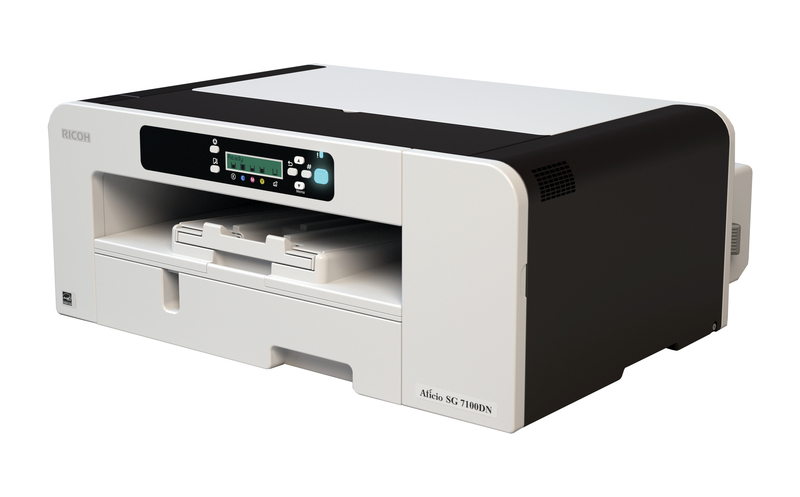 Print speed for the SG 7100DN are comparable to previous Ricoh models, making it the perfect next step in the line of high production sublimation systems. Ink for this printer is available in standard and extended size cartridges. Standard size cartridges are designed for moderate and seasonal print flows, and provide lower start up costs while business is ramping to full capacity. Extended cartridges , by contrast, are ideal for high volume sublimation environments and provide extended uninterrupted printing, without adding a bulk system to your printer set-up. EnMart offers the printer as part of our popular sublimation combo packages. The SG 7100DN package retails at $1678 but is currently being offered by EnMart for $1545. The printer package comes with the printer, a full set of ink, 1 pack of 8.5 x 11 paper and 1 pack of 11 x 17 paper, a USB cable and more. EnMart is proud to announce that the Ricoh SG 3110DN printer is NOW IN STOCK! The 4th generation Ricoh SG 3110DN replaces the popular Ricoh GX e3300n. 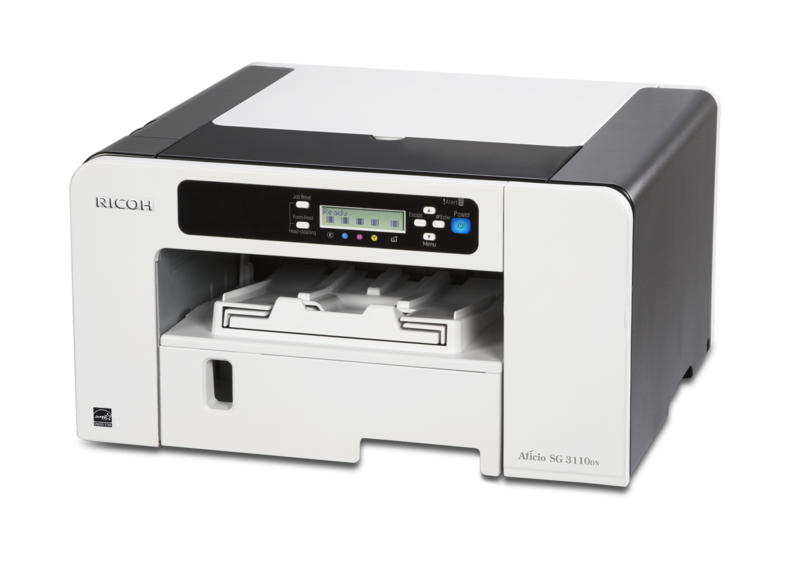 The new Ricoh SG 3110DN is the most versatile sublimation printer to date. It is also a budget smart option for those people looking to enter the market for sublimation products. A ChromaBlast cotton transfer printing option is also available for the Ricoh SG 3110DN. Since the Ricoh SG 3110DN can produce up to 74 prints an hour, it is one of the fastest entry-level cotton transfer printers available. When used with ChromaBlast media and ChromaBlast Ink, this printer produces transfers which can be used to create vibrant, long lasting images on cotton. 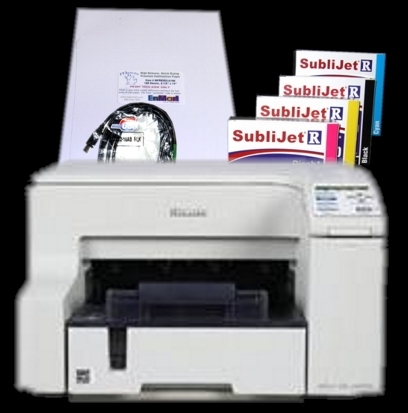 The Ricoh SG 3110DN sublimation and ChromaBlast printer systems are definitely the smart choice for those looking to get into the sublimation printing and/or t-shirt transfer business without breaking their budget. EnMart also offers combo packages featuring the Ricoh SG 3110DN for both sublimation and ChromaBlast. These packages contain everything you would need to print a sublimation or ChromaBlast transfer. If you want to be successful with a sublimation business, the first thing to remember is that everything starts with the printer. The printer you elect to use will determine the overall quality of your prints, the size of the items you can sublimate, the speed of your printing, and how many headaches you may have to endure as you work to get the printer printing correctly. Obviously choosing the proper printer is important, but how do you determine which printer is the proper printer for you? Here are three things you should consider. First, look at the size of the prints you will need. The size of the print is determined by the size of the items you plan to sublimate. Make sure you look at the largest item on your list, as that is the maximum print size your printer will need to create. If your largest item is a license plate or a coffee mug, you won’t need a printer that will print 13 x 19. Second, consider how often you’ll use the printer and for what. Quality always matters, but so does the rate of usage of the printer and what you’ll be printing. Both Ricoh and Epson printers provide great quality. Epson printers may require more maintenance and more frequent use but (depending on who you ask) the 6 and 8 color models have a very slight edge when it comes to fleshtones and pastels. Epsons are generally preferred by professional photographers. Ricoh printers tend to be faster, generally have very few maintenance issues, can often sit for days or weeks unused without cleanings, and are designed more robustly. Third, determine the cost of the print. For low to mid level Epsons, ink cartridges are considerably more expensive. Using a bulk system may lower cost, but it can also introduce a whole new set of potential problems into the mix. If you choose to go with a higher end Epson, you can get 8 large size cartridges at a bulk price, without having the headaches that a bulk system might potentially cause. The Ricohs, on the other hand, give you the best of both worlds, four inexpensive cartridges, but enough ink to qualify as large capacity and no need for a bulk ink system. To see more about ballpark price for prints, you can view the EnMart printer comparison and approximate printing cost PDF on the EnMart website. 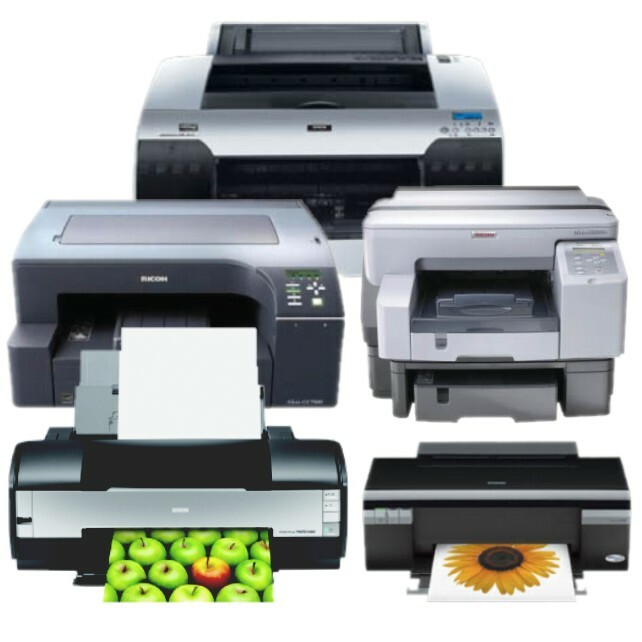 After you’ve answered the questions and viewed the data, your choice of printer should be fairly simple. Once your printer has been chosen, it’s time to move on to the other major choice you need to make, choosing a heat press. That choice will be the focus of our next “Get Started with Sublimation” post.